For your curious ears (and eyes), here are some of my most recent premieres. Performed by ICE (Alice Teyssier), and New Music Detroit (Vicky Chow). Commissioned by Riot Ensemble (UK). chain maille (otherwise known as mail) is a type of armour consisting of small metal rings linked together in a pattern to form a protective mesh. With an exclusively metal timbral palette, this percussion quartet explores the concept of chain maille from several entry points – using the mesh pattern as fodder for musical material, examining associations of its medieval history, and most directly, using a chain maille hood as a percussion instrument. chain maille also investigates the idea of armour – the heavy armour we carry to protect against harm, both physical and emotional. chain maille was written for the Sam Houston Percussion Group under the direction of John Lane. "Space, on the ship Persephone, approaching Jupiter (to use it as a gravity sling) on the first manned voyage to Pluto. Jupiter looms ahead, many moons already visible. An asteroid is caught by the planet's gravity. It hurtles inward and explodes before it can disappear beneath the swirling gas. ​Seina stands at the display, watching as she speaks to the NASA dispatcher in Houston...."
cognitive dissonance is for violin, piano, and Anthony T. Marasco’s instrument invention of amplified springs, the Oxblood. I met Anthony at the UnCaged Toy Piano Festival in New York City, where he demonstrated an array of invented instruments. Marasco describes the instrument: "The Oxblood is an electro-acoustic instrument consisting of four springs amplified by contact microphones. Each spring consists of a different thickness and tension and is suspended across the instrument’s solid wooden body, attached to steel L-shaped brackets. A handmade contact microphone is attached to each set of brackets in order to directly amplify the vibrations of the performers’ interactions with each spring. The performer can excite the Oxblood’s springs through various scraping, plucking, bending, and snapping techniques." Posited by Leon Festinger, cognitive dissonance is a psychological concept whereby someone holds two competing beliefs at the same time. These inconsistent cognitions are said to be dissonant, and cause an individual to feel “psychologically uncomfortable”, with a drive to find a way to make these two beliefs consistent, or consonant. When I first learned this term, I found the concept to be fascinating, because so often decision-making requires so many compromises and concessions, and this concept illustrates that feeling of tension when two deep beliefs cannot be reconciled into a singular entity. I love the possible musical implications that emanate from this rich concept – two musical ideas are independent but cannot merge; one idea must be sacrificed for another; the dissonance that exists between two elements. With the Oxblood as an external representation of the underlying psychological discomfort, both the violin and piano try and make sense of the various ideas in their own ways and with their own concessions. cognitive dissonance was written for Cheryl Duvall and Ilana Waniuk for the “Premieres III” concert of the Thin Edge New Music Collective. "attach" started out as a very simple idea, clean, considered and well thought out. But even simple ideas are not immune to inertia, and the core drive of the idea began to evolve, complicate, unhinge, and tangle in on itself. attach is about reserve and abandon, about the need for order to exist with the beauty of chaos, and about the discrepancies between what is, what is supposed to be, and everything in between. "attach" was written for Angela Schwarzkopf for the Toy Piano Composers' concert Tension/Resolution. 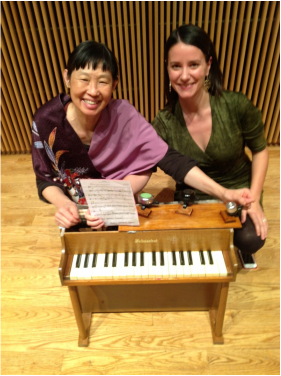 clangor, for toy piano and bicycle bells, was written Margaret Leng Tan for the 2013 UnCaged Toy Piano Festival. In the forest, glow. is based on the illustration Don't Feed the Deer by Brandon James Scott, a Toronto-based artist and also a good friend of mine. His works have a decidedly playful feel to them, especially in his work with animation and illustration. Animals are a frequent subject, often popping up in unusual settings, such as kitchens, bars, and rock arenas. I was originally enamored with Don't Feed the Deer because it has a mysterious, magical, and yet almost foreboding quality to it. Scott says of the work: "When I originally made it... I wanted to make something dreamlike, fantasy-based: the colours, the glows, the design of the world. But are we walking down this path, are we supposed to see what's beyond it? Are we meant to observe but not touch things, because of a hidden danger? Are there always deep dark fears lying hidden amidst beauty?" passive aggressive - defensive - contempt - stonewalling is a four-movement work depicting the four destructive emotions that can unravel the delicate framework of relationships. I was inspired by Malcolm Gladwell's book Blink, and especially a chapter that featured a psychological experiment by John Gottman. In the "love lab" experiment, Gottman videotaped over three thousand married couples having brief (and often mundane) conversations, and analyzed every conceivable emotion that occurred in these interactions, using an elaborate coding system. Reading every possible emotional nuance in people's facial expressions, Gottman annotated instances of disgust, sadness, neutrality, anger, etc. Gladwell writes, "On the basis of those calculations, Gottman has proven something remarkable. If he analyzes an hour of a husband and wife talking, he can predict with 95 percent accuracy whether that couple will still be married fifteen years later." Through this research, Gottman categorized the "four horsemen" that are the most predictive in failed relationships: criticism, defensiveness, contempt and stonewalling. attacks and barbs. The piece ends with stonewalling, where wordless strings come up against an unmovable barrier. Cake, is a comedic operetta featuring Maureen Batt, Marta Herman, and Jeremy Ludwig, and accompanied by Wesley Shen (piano) and Katherine Watson (flute). This was premiered in January 2012 in the Toy Piano Composers concert Opera Scenesters. I "savored" every bit of this piece - it was so much fun to write, rehearse and present! The second, smart aleck, is a piece for solo toy piano that I wrote for Pascal Meyer, a toy piano enthusiast from the Netherlands. I met Pascal when I was the emergency page-turner for his piano duo concert in Toronto at Gallery 345 last year. After bonding over a shared love of toy pianos, he later asked me if I had anything for solo toy piano for an upcoming concert. The only piece I had was specifically written for a female performer, so I decided (as I often do): Why not write a new piece for toy piano?